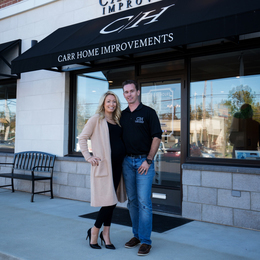 At family-owned Carr Home Improvements in Chalfont, homeowners discover a one-of-a-kind showroom designed to help them create the kitchens and bathrooms of their dreams. Colby Carr’s life looks much different than it did a little over a year ago. Back then, he had grown tired of a 16-year run of driving his pickup truck to and from home-improvement jobs throughout Bucks and Montgomery counties. The workday often stretched to 14 hours, denying him time with his wife, Jennie, and their sons, ages 8 and 6. Time with his family, as he saw it, was slipping away. On the advice of his then-ailing father, Thomas Carr, Colby decided to take a risk. He renovated a family building with the idea of opening a showroom and design center to help clients transform their kitchens and bathrooms into the sanctuary-like spaces of their dreams. The result: Carr Home Improvements in Chalfont. Carr’s marathon days behind the wheel may have ended, but his drive to serve customers rolls on. His mission is to utilize his experience to remodel clients’ homes, from powder rooms to gourmet kitchens—all with one focus in mind: to provide customers with qualified, cost-effective, reliable products and services. While browsing throughout Carr Home Improvements’ 4,000-square-foot design center, homeowners will see products they’ve come to know and trust, including plumbing fixtures by Delta, Brizo, and Moen, kitchen and bathroom hardware by Top Knobs and Atlas Homewares, countertops by Caesarstone, Silestone, Zeal, Polar Stone, and flooring by Armstrong and Johnson Hardwood. The showroom offers a variety of colors, displays, and options to help guide customers during their decision-making process. It also features a gourmet working kitchen and plumbing selection center, as well as areas devoted to wine bars, wine refrigerators, and wet bars. Although it’s only a year old, Carr already has plans to upgrade the showroom. Upgrades will include the addition of 15 bathroom sanctuaries, additional vanity countertops, bathroom selections, and kitchen vignettes. The focus on the customer extends to all members of the family. While Mom and Dad browse the showroom, their children can pass the time in the Kid Zone, a 10-by-20-foot room with video games, stuffed animals, and beanbag chairs. Treating customers like members of the family comes naturally at Carr Home Improvements. In addition to the husband-and-wife team of Colby and Jennie Carr, Colby’s sister, Elizabeth, works to help with the day to day operations. Bringing Jim on as the team’s 20/20 designer was the last piece of the puzzle. With a background in landscape architecture, he has experience in various realms of design and brings a unique perspective to every project. His understanding of color, texture, form, and function paired with Jennie’s incredible vision for interior spaces gives this team the ability to tackle any home improvement project with ease. The showroom is a constant reminder of the man Carr credits for its very existence: his late father, Thomas. Customers who visit Carr Home Improvements will notice photographs of the family patriarch on the showroom walls.